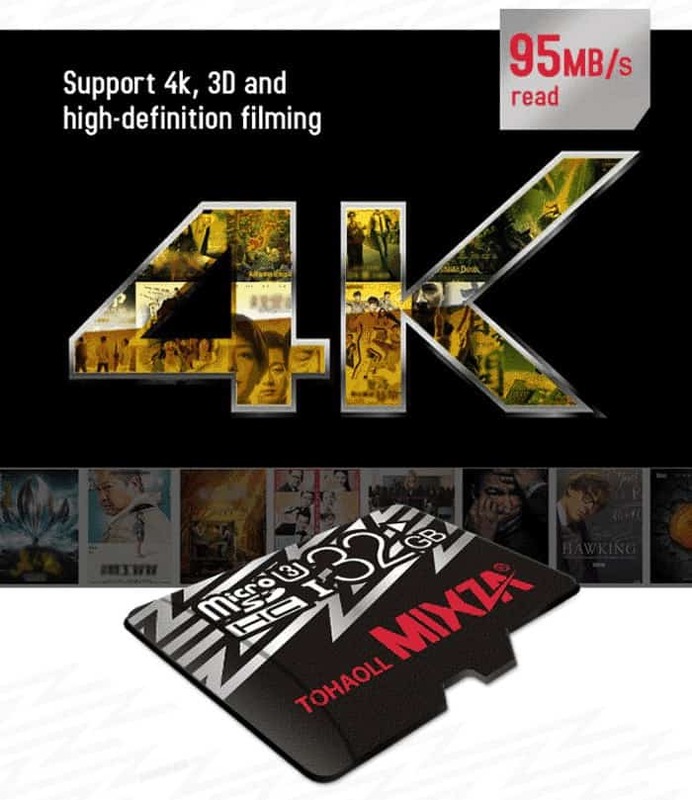 MIXZA MicroSDXC Class 10 U3 64GB Memory Card is a high speed transmission with reading speed up to 95mbps, which makes it one of the fastest data storage card available for your action camera or smart phone today. Record 4K videos at blazing fast speeds without any hassle. These cards are fast for better pictures, app performance, and Full HD / 4K videos. Ideal for Action cameras, Android smartphones and tablets, these U3-rated cards load apps faster for a better photography experience. With up to 64GB capacity, you have the capacity to take more pictures and 4K videos and capture life at its fullest. Built to perform in harsh conditions, MIXZA Micro SDXC Memory Cards are waterproof, temperature proof, shockproof, and X-ray proof. The microSD card is rated U3 Class 10 for 4K video recording performance. Compatible with all 4K Cameras supporting SDXC cards, like GoPro, Canon, Nikon, Garmin, SJCAM, Amkov, Xiaomi Yi, MiJia, etc. Also Compatible with flagship level Android Smart Phones. High speed transmission: With reading speed up to 95MB/s and writing speed up to 80MB/s, you will be able to edit, store, and share your photos faster than before. MIXZA TOHAOLL U3 enables you to enjoy the visual feast, supports level 3D and 4K high-definition recording. No matter you are a professional photographer, cameraman, or mobile equipment user, the super speed transmission of U3 can meet your need. Helpful protective functions: Water resistant, heat resistant, anti radiation and anti-shock can effectively protect your data better. Very fast card. good quality. fast shipping. Max speed is as fast as described. So far working well, no issue. Got them when on sale. Very good value. I received the card very quickly, then shipped it quickly and I mounted it on my wife’s cellphone who recognized her regularly and for now she has never given any problems, great transfer speeds. Recommended. Perfect transaction, fast shipping, good quality and low price! Хорошая карта памяти за невысокую цену. Установил в фотоаппарат через переходник, скорость не замерял, но все работает шустро. Посмотрим как она по надежности – и в будущем куплю еще на 64 гб.